Privately-owned housing units authorized by building permits in November were at a seasonally adjusted annual rate of 1,201,000, 4.7 percent below the revised October rate of 1,260,000 and 6.6 percent below the November 2015 estimate of 1,286,000. Privately-owned housing starts in November were at a seasonally adjusted annual rate of 1,090,000, 18.7 percent below the revised October estimate of 1,340,000 and 6.9 percent below the November 2015 rate of 1,171,000. Privately-owned housing completions in November were at a seasonally adjusted annual rate of 1,216,000, 15.4 percent above the revised October estimate of 1,054,000 and 25.0 percent above the November 2015 rate of 973,000. The home price index (HPI) in October 2016 was up 6.7 percent year-over-year. The Q3 negative equity share was 6.3 percent. The cash sales share as of August 2016 was 31.1 percent. There were a total of 86,561 U.S. properties with foreclosure filings in November, down 18 percent from the previous month and down 17 percent from a year ago. 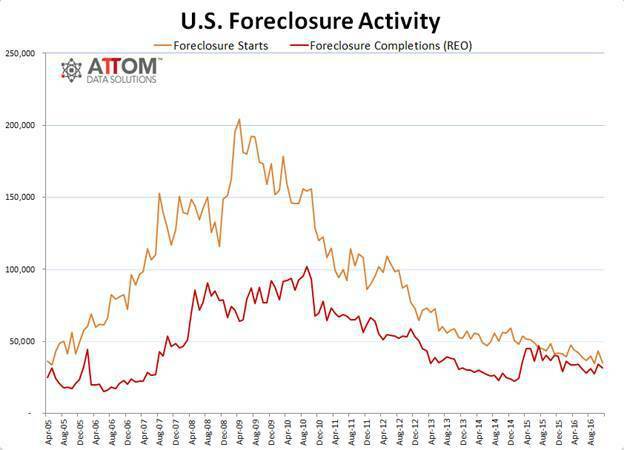 A total of 35,222 U.S. properties started the foreclosure process in November, down 19 percent from the previous month and down 15 percent from a year ago. A total of 31,806 properties were repossessed by the lender (REO) in November, down 7 percent from the previous month and down 21 percent from a year ago. 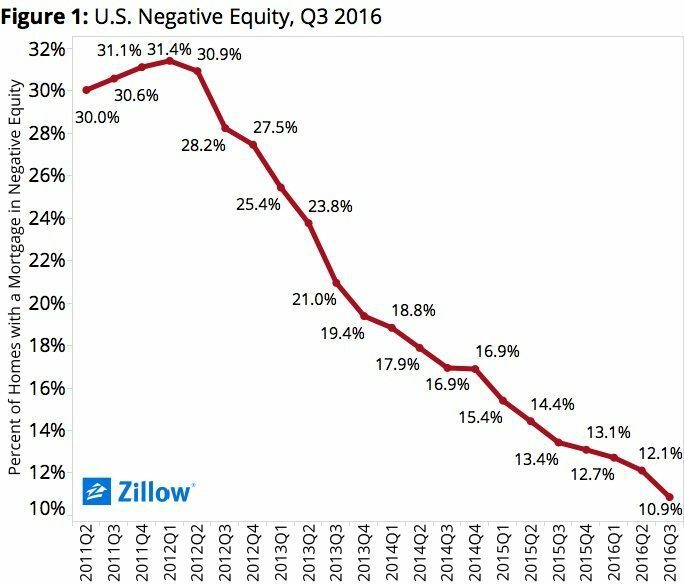 The negative equity rate fell to 10.9 percent in Q3 from 12.1 percent in Q2. It’s also down from 13.4 percent in Q3 2015. 26.1 percent of homeowners with a mortgage are in “effective” negative equity, with less than 20 percent equity in their homes. 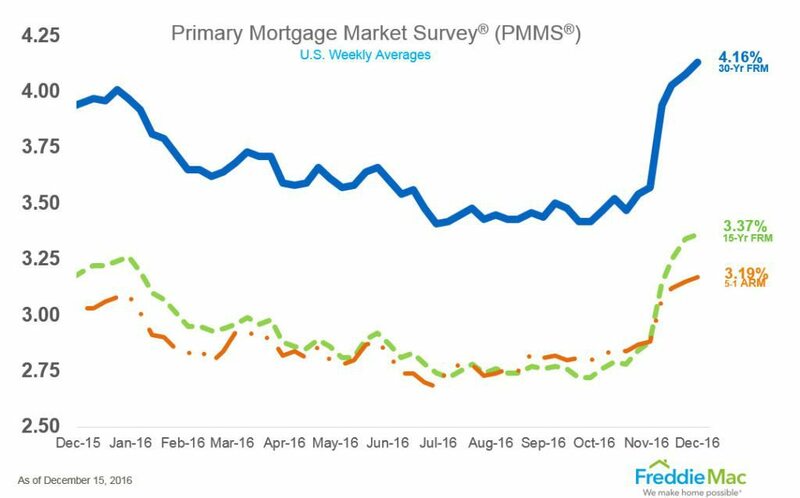 The 30-year fixed-rate mortgage (FRM) averaged 4.13 percent with an average 0.5 point for the week ending December 8, 2016.